Home > OCT 2017 > UTI Mastershare : More than 30 years of Wealth Creation- Generated 73 times returns..! UTI Mastershare : More than 30 years of Wealth Creation- Generated 73 times returns..! UTI Mastershare Unit Scheme is India’s first equity oriented fund launched in October 1986 and it has completed more than 30 years of Wealth Creation. UTI Mastershare has a brilliant track record of 31 years of uninterrupted dividend distribution across all market cycles- be it bearish or bullish. Even during the extended bearish phase of 2000-2004 when many funds skipped dividends, UTI Mastershare paid dividend due to its prudent investment policy. The scheme has also rewarded investors with bonus and rights on many occasions. This scheme is an open end equity oriented scheme having a corpus of Rs. 4362 crore (as on August 31, 2017) and 5.33 lakh investor accounts (as August 31, 2017). It aims at securing capital appreciation / or income distribution over a long term, by investing in equity shares and equity related instruments and fully convertible bonds/debentures of companies. The scheme follows a disciplined approach to invest and has maintained stream of annual dividend by booking annual profits. UTI Mastershare is a predominantly large-cap focused fund. The scheme’s top holding consist of well known and researched companies like HDFC Bank, , ICICI Bank, Infosys, Kotak Mahindra Bank, Maruti Suzuki India, Indus Ind Bank, TCS, Mahindra & Mahindra, Tata Motors, ITC, Reliance Industries, BPCL and L&T which account for 46% of the portfolio. Scheme has a well disciplined investment criterion in sector/stock allocation and number of stocks. The scheme has been a steady performer with lower volatility. UTI Mastershare has generated a return (CAGR) of 14.92% against benchmark return of 13.92% since inception (as on 31.8.17). Just to highlight the growth of investment into the fund that an amount of Rs.10,000 invested at inception has become Rs.7,33,898/- at the end of August 2017 as against Rs.5,60,545 as per benchmark-S&P BSE 100. The scheme has generated 73 times returns in the last 31 years. UTI Mastershare has an efficient expense structure on account of a large corpus and a lower portfolio turnover ratio which in turn provides scope for superior risk adjusted returns. Ms. Swati Kulkarni, Executive Vice President and Fund Manager, UTI AMC, said, “UTI Mastershare invests predominantly in companies with large market capitalization whose earnings growth potential is better. Often, these large cap companies generate strong and sustainable cash flows, have cost advantage due to size and enjoy leading position in the market. UTI Mastershare maintains a well-diversified portfolio and avoids sector as well as stock concentration at all points of time. This has helped the Fund in generating steady returns and has helped the fund to weather the market phases effectively in the past." UTI Mastershare is suitable for those equity investors who are looking to build core equity portfolio with relatively stable and sustainable performance and also for those who prefer regular dividend with capital appreciation. 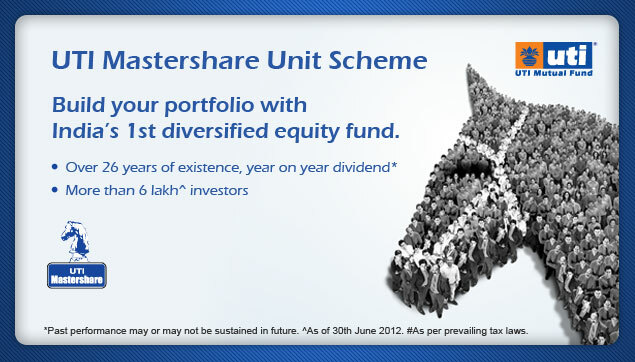 UTI Mastershare may be considered as a part of one’s Core Portfolio, given its investment philosophy.